If you are having sleeping problems but you don’t feel you have full-blown insomnia, you may have what is referred to as semi-somnia. This is when you are able to get some sleep, but it is not restful sleep. The symptoms of semi-somnia can include difficulty falling asleep (because your mind is constantly thinking), waking up and not feeling rested, waking up intermittingly throughout the night, feeling like your body is asleep but your mind is awake, and just overall poor sleep. Even our shopping and interacting with family and friends is primarily done online these days. Because we are constantly accessing information, and even finding our relaxation and fun through gadgets, our brains remain in a state of arousal. They do not have adequate time to wind down. Our brain is on information overload and sometimes it has trouble coping with the amount of input it is getting. Just like your body needs rest, so does your brain. Here are some things you can do to get over semi-somnia. When you are working, take information mini-breaks every two hours for a few minutes. Get up from your desk, walk around, do anything you want away from your computer, but do not pull out your phone and check it or social media sites. If you do, you are defeating the purpose of the information mini-break. 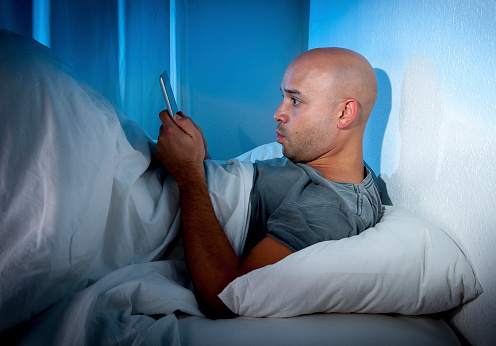 Turn all gadgets off one hour before you plan to go to bed. This is referred to as “electronic sundown”. If you are concerned that a child or loved one would not be able to reach you in an emergency, consider getting a landline just for that purpose. Do not read emails, messages, or any other type of correspondence from people beginning in the early evening if they have the potential to stress you out and keep your brain on alert. Wait until morning to read them and to respond. Otherwise, you may lay in bed all night thinking about them. Instead of relaxing and spending your free time doing things that are technology based, do things the old fashioned way. Find hobbies and activities that are not “plugged-in." Your brain needs this so it can recuperate from all the information it is already processing. Take some time to just sit in the evenings and do nothing but let your body and mind relax. If you think you are dealing with semi-somnia, do what you can now to stop it. If you don’t, you are risking the chance that your body and mind will develop poor sleeping habits that stay with you for the long term. Semi-somnia is not as debilitating as insomnia itself. However, over time it can set you up for full blown insomnia, so it is not to be ignored. Martin is the creator of Insomnia Land’s free two week sleep training course. His course will help you beat insomnia without sleeping pills. Over 3,000 insomniacs have completed his insomnia treatment course and 96 percent of graduates say they would recommend it to a friend.